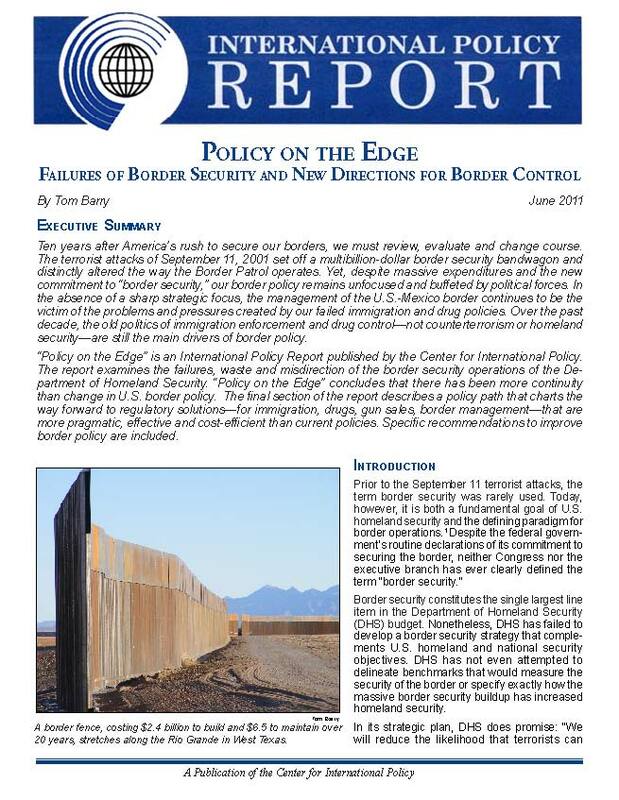 Read the HTML version of "Policy on the Edge"
The Center for International Policy's TransBorder Project is pleased to share its new report "Policy on the Edge: Failures of Border Security and New Directions for Border Control." This new International Policy Report discusses the unsettled state of America's post-9/11 border security policy. The terrorist attacks of September 11, 2001 set off a multibillion-dollar border security bandwagon. Much like the way the Bush administration launched the “global war against terrorism” and the wars in Iraq and Afghanistan in a burst of misguided patriotism, the administration also thrust us into a new era of homeland security and border security with little reflection about costs and consequences. Despite massive expenditures and the new commitment to “border security,” our border policy remains unfocused and buffeted by political forces. In the absence of a sharp strategic focus, the management of the U.S.-Mexico border continues to be the victim of the problems and pressures created by our failed immigration and drug policies. Setting forth new vision of pragmatic immigration reform that is not conditioned on the ambiguous notion of border security. Tom Barry, the author of the timely policy report, directs CIP’s TransBorder Project, which provides expert analysis on U.S.-Mexico border issues, immigration policy, and homeland security policy. Barry is the author of Border Wars, forthcoming from MIT Press in September. Two previous CIP policy reports by Barry examined the related issues of high-tech border security operations (Fallacies of High-Tech Fixes for Border Security PDF) and the dangerous merger of the immigration enforcement, drug wars, and crime crackdowns (Immigrant Crackdown Joins Failed Drug and Crime Wars PDF).